I’ve written previously about the Kwajalein Atoll and what is known in military circles as the Ronald Reagan Ballistic Missile Site. It’s part of the Missile Defense Agency (MDA) and is a premiere asset within the Department of Defense Major Range and Test Facility Base. I happen to know a little about “Kwaj” (aka: Kwajalein Island) having lived, worked on the island and flown in/out of Bucholz Army Airfield. I haven’t blogged about my SCUBA diving experiences while on the island or discussed what was called the ‘aircraft graveyard’ of Kwajalein Atoll, but this came to my mind today when Oregon State Police (OSP) reported that loggers discovered a WWII-era U.S. Navy aircraft, specifically a Curtiss SB2C Helldiver near Rockaway Beach, OR., as part of logging operations on private property. Designed in 1939, the Curtiss SB2C ‘Helldiver’ was a single-engine dive-bomber intended as the replacement for the earlier Douglas-built SBD ‘Dauntless’. SB2C stands for Scout, Bomber, second dive bomber contract from Curtiss, and the ‘C’ was the letter assigned by the Navy to all aircraft built by Curtiss Aircraft Corporation. 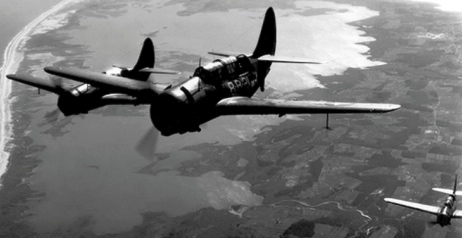 The Helldiver carried a crew of two — a pilot and a rear gunner who doubled as the radioman. Early versions of the Helldiver were armed with a single machine gun in each wing while later versions carried a 20mm cannon. The aircraft had an internal bomb bay and could carry a variety of bombs as well as depth charges. The Helldiver had a top speed of 295 mph and good range, making it an essential tool in the Pacific war. Flying from the USS Bunker Hill, Helldivers of Bombing Squadron 17 saw a lot of action over Kwajalein Atoll during Operation Flintlock, which was the assault on the atoll in early 1944. Helldivers helped sink a number of the Japanese ships that lie on the lagoon floor and which we often had the opportunity to dive on. They flew strikes against targets on several islands within the atoll. After the Japanese airbase on Roi-Namur was captured by American forces the Marine squadron VMSB-151 was initially assigned to Roi with SBD Dauntless dive bombers. 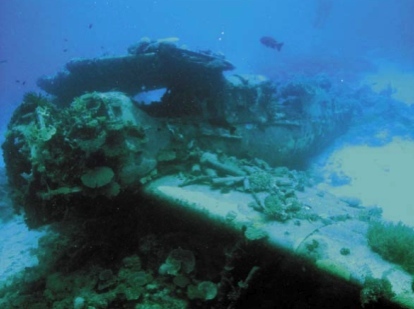 The aircraft graveyard near Mellu Island has the wreck of at least one Helldiver. One wreck we found lies in 85 feet and has one wing in the folded position. Parts of the tail are nearby. The wreck is missing the canopy and dive flaps, and we were never able to determine the specific variant of this particular aircraft. Unless a data plate can be located and photographed that has the manufacturer’s serial number, the history of the plane is very difficult to determine. But I’ve digressed and need to get back to Oregon’s SB2C find. So the search process will begin with historians and analysis gathering to determine the air station where the aircraft flight originated. The OSP Bomb Technicians have searched the area and found no signs of unexploded ordnance, but there is a possibility of human remains on the site and a team of U.S. Navy personnel are working on-scene to investigate. All information is being shared with the Joint Prisoner of War/Missing in Action Accounting Command (JPAC) in Honolulu. The nearby Naval Air Station Tillamook was primarily used to house blimps and was base operations for Squadron ZP-33. Because of steel rationing during WWII the hangars were built entirely of wood. It was decommissioned in 1948 and is located about 20 miles southeast of the crash site. It’s unclear if this aircraft is from the Tillamook station, but the Navy team is on-scene and is making a thorough, undisturbed investigation as safety and integrity of the aircraft site is important. Initial responders reported seeing a wing, tail section, landing gear and other debris spread out over an approximately 200 yard heavily-wooded area. I’ll update this post as more information becomes available. UPDATE: 26 March 2010 – Additional news reports HERE, HERE and HERE. OSP provided a news release last night stating information as to the exact location is not being released to media in an effort to maintain scene integrity. Oregon State Historic Preservation Office (SHPO) Archeologist Matthew Diederich advised that it is a violation of State Law (ORS 358.905-955) to alter, damage, or remove material from this archaeological site. Violators will be prosecuted. 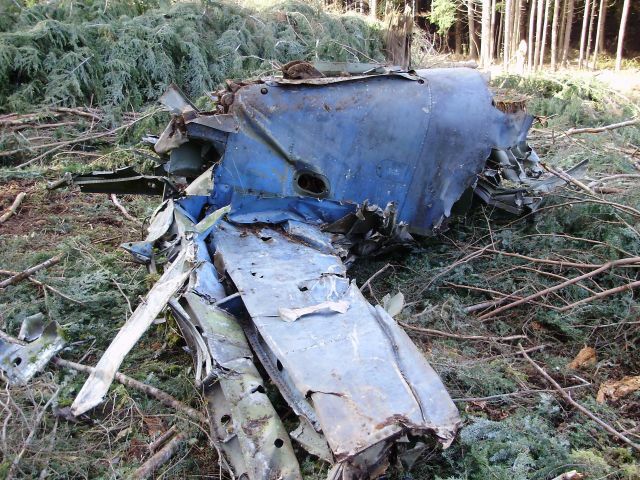 Important to note that the aircraft was discovered on 18 March 2010, but OSP released information on the discovery a week later on 25 March 2010. Photos from the location area seem to indicate that the logging crew had already cut and removed much of the timber. It’s unknown if they did so prior to notifying authorities. If they trampled the so-called “archaeological” scene with equipment prior to notifying LEO will they be subject to ORS 358.905-955? 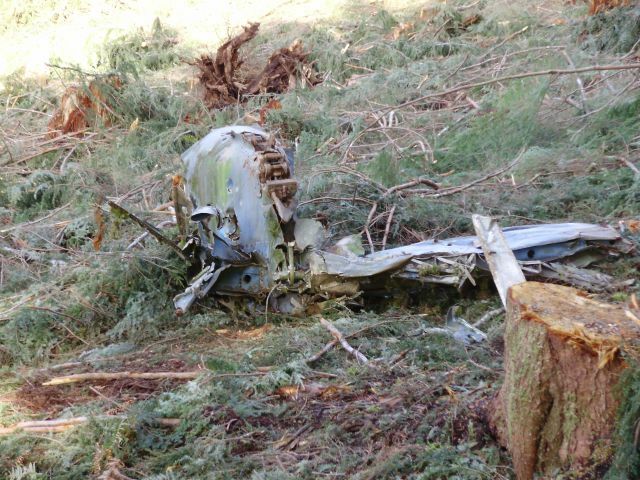 The Oregonian reported that Sig Unander Jr. (a Cornelius resident) who has spent years researching and tracking down wreckage of military planes estimates there are approximately 30 military aircraft in WA., OR., ID., and MT., from the mid-1930’s through the mid-1940’s that are unaccounted for. UPDATE: 31 March 2010 – Oregonian reported that a former mechanic for the Navy (Alvin Boese) remembered the crash which was first published on 1 April 1948. A story which ran the next day stated the pilot was identified as Chief Aviation Pilot R.W. Smedley of Long Beach, CA. The Navy has not confirmed this crash was the same or would they comment on the circumstances of this “new” find until they were confident of the results. Photo’s courtesy of Bluejacket.com and OSP.